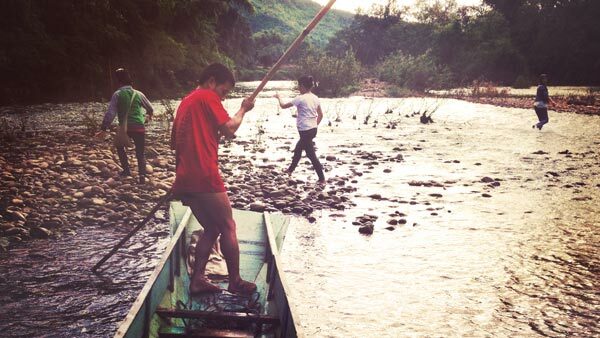 V’s village is best accessed by hiking through a bit of jungle and boating down the Nam Nga River. His family spends most of the year farming rice for food. The other months, his father sells his own hand-poured concrete beams to a local construction company. 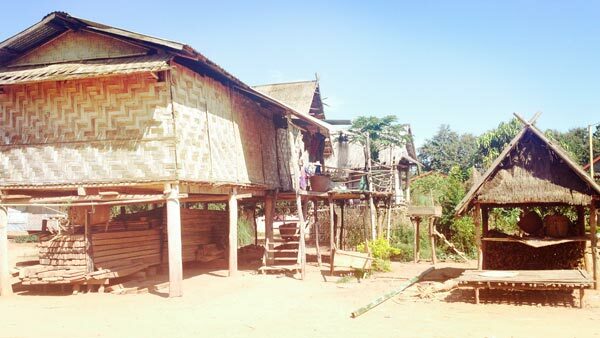 Like many Laotians, V has very little access to money. V owns fewer changes of clothes than the average weekend traveler has folded in their valise. Paypal won’t transfer money to Lao bank accounts. When I met V five years ago, he was a novice monk in Louang Prabang. In passing, he mentioned what he felt was the exorbitant cost of college: $250 per year. Yet he desperately wanted the opportunity to study and move himself out of poverty. I slipped him the cash on my way out of town. We kept in touch through email and then Facebook. He was always sending blessings and good wishes and thanks. Four years later, he walked with a degree in civil law. Then he headed back to his village to help his family with the rice harvest. When I arrived at this table at this particular moment in V’s life, a law job near his village had opened up. Two job openings. Over a hundred applicants were lined up to take the entrance exam. That’s around five hundred US dollars; a spendy sum for most anyone. A meager bribe by some standards. I thought about it for the days we spent together in his village. Was it possible to work around this speedbump of corruption? On one hand, V could study and ace the exam and (maybe) they’d have to hire him. Could hard work and honesty win? He’s already studying his law books through the nights. The risk: these job openings only open annually. Veracity could set V’s career and monetary prospects back an entire year. I tried planting seeds against corruption in his mind. V and I communicate well, except for this point. He doesn’t seem to understand me when I speak about how corruption is the root of the impoverishment and misdistribution of wealth in the world today. Especially in developing nations like Laos. I tried making bold statements. V, corruption is why your village doesn’t have a school. V, corruption is why we’re riding in the back of a pickup truck and not on public transportation. V, corruption is the reason your family is poor while other people drive around in fancy cars. But V won’t hear it right now. He’s 24 and he wants a motorbike, an apartment, and a girlfriend. He wants money. If corruption brings those things, then he wants corruption, too. On the last night, V’s family sat with me on the sparsely furnished floor of his cousin’s house. Baskets of sticky rice between us. Small bowls of searing hot lime-flavored dip. Duck curry. Pig’s blood soup. A feast. 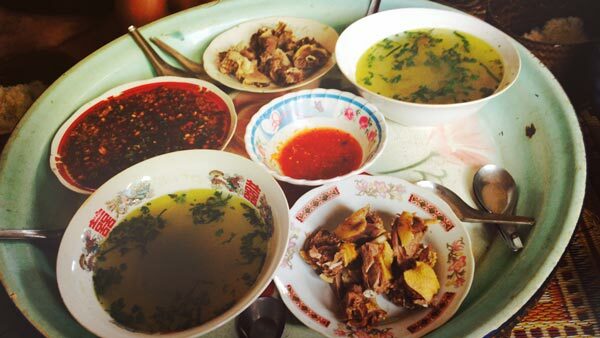 Afterwards, we sat back on a long, hand-hewn table and sipped Beer Lao. I offered him the four million, but asked that he pay back half within a year. He agreed. I heard that research had been conducted into the effectivity of NGOs and charities which concluded: just give them money. Don’t try to dig their wells or plant their seeds or pave their streets or build their schools. Just give money to the people who need it. Let them sort it out. You can give a man a fish and he’ll eat for a day… but you can give a man four million kip and let him live his life the way that it makes sense to him. This week I received a text from V. He paid the bribe. Five million, actually; an additional million from his parents. I fear that once he is motorbiking the streets of Louang Prabang, girlfriend’s arms around his waist, he might conclude that maybe this corruption thing isn’t so bad. His family sold their garden to afford a year’s rent for an apartment near his new office: $420 US dollars. His job as a civil lawyer starts in May. Story and photos by Daniel Braha. He is simply known as braha in Instagram and welcomes you to contact him through Facebook or Tumblr. Once in a while, we invite our friends who love writing as much as they love traveling to share their travel stories in The Dusty Sneakers. The repository of their travel tales is hosted in the Guest Writer category. amazing story.. i think it’s hard to become a Laotian and same problem with our country. corruption. Indeed, Farchan. Dan’s story reminded us of Indonesia and we had a lengthy chat with him about it. And it pains even more because similar things happen here, too. Is there such a thing as a country without corruption? I fear not. A thing such as a country without corruption? Yes there is such a thing mon ami. In fact, there are some! Try Denmark, New Zealand, Sweden, Finland, Norway, and our neighbor Singapore. It was perceived that no corruption exist in these countries. Corruption as in an abuse of public office for private gain. So yes there are some and yes Indonesia can be one as well. How? Well, Indonesia will not be harmed by those evils who corrupt but by those who know that they corrupt and let it happen. If you happen to know these evils, do something about it. If you were asked to bribe for a driver license, an ID card, a vote, or getting government’s contract, do something about it, frame the evils, get them on record, tell the supervisors, tell the press or an independent agency if you have to. Just so something, aim small miss small. Arip Syaman is on fire! so we’ll have things to discuss over lunch, eh? in addition to Mt. Agung hiking plan. Deal it or not, corruption is born because we allow it..